Moving interstate commences a new chapter in many people’s lives. It is an exciting time as you plan to make new friends, explore new places and learn new things. To ensure that your transition is pleasant, engaging an interstate removalist in Melbourne can help. To ensure that you choose a professional interstate removalist, remember to ask for their Australian Furniture Removers Association (AFRA) accreditation. The AFRA is an official body that regulates the removals industry. To guarantee that removal companies remain compliant with best practices, AFRA provides accreditation only to organisations that have the necessary equipment, vehicles, premises and staff training needed to complete a professional move. In a previous blog, 5 Questions to Ask Your Interstate Removalists in Melbourne, we armed our customers with important questions they should ask to a removalist before engaging them. In this blog, we talk about the 5 benefits of using an AFRA accredited interstate removalist in Melbourne. In Australia, moving interstate requires long distance haulage. This means that your personal items need to arrive at your new home in a safe manner. AFRA accredited organisations have reliable vehicles and equipment to provide you peace of mind during the transition. Check to see if the interstate removalist has different sized vehicles so that you can select the capacity to suit your requirements. Also, they should have equipment such as lifts, padding material, trolleys, hoists, and more to safely transport your belongings. Removing, transporting and delivering items do require skill and experience. Care needs to be taken to ensure each personal item does not arrive damaged or broken. Professional interstate removalists have the know-how to carefully store all items in the vehicle to maximum space and ensure that there is no damage during transit. They will also be able to carefully unload the belongings according to your requirements to help you unpack in comfort. Whilst your belongings are in transit, it is important that your interstate removalist has the necessary insurance cover should anything go wrong. Make sure to enquire about this and to assess whether the final cost includes insurance cover or not. It is better to have this in writing so that you are aware of the terms and conditions. Always do your research. Surf the internet to assess the reputation of the interstate removalist you propose to engage. Call them and ask questions and make sure you are satisfied that they will suit your needs. Read online reviews and talk to friends and colleagues for any recommendations they might have. With AFRA accreditation, you can have the comfort knowing that the industry body rates them well. An interstate removalist with nationwide presence means that the driver can return the vehicle to various depots without having to travel far. Return-to-depot fees can be costly if the arrival destination is located far from a depot. Ensure that you discuss this aspect of the fee with the removalist so that you understand the scope of the costs. Engaging a nationwide removalist will assist in lowering this cost. Selecting an AFRA accredited Melbourne interstate removalist will help with your transition. 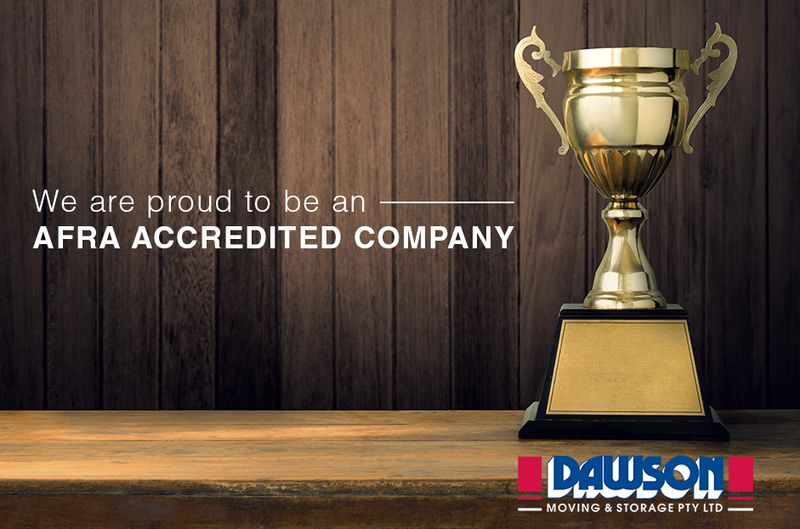 At Dawson Moving and Storage we are AFRA accredited, with reliable vehicles, trained removalists and a nationwide presence. Call us today on (03) 9763 0222 or request a quote online. Are you planning to move interstate? What qualities do you look for in a professional interstate removalist in Melbourne?